Water can penetrate cracked or loose tiles, and cause damage to the roof lining underneath. 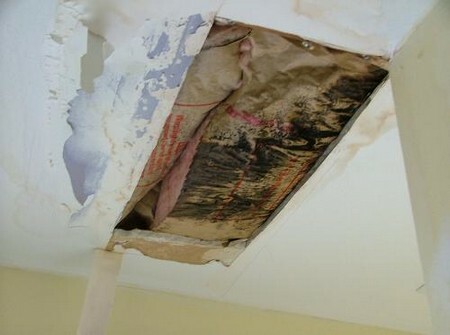 It is always better to deal with roof leaks before any water penetration causes secondary problems. Find the source of the leak. If this is not apparent from the ground, use binoculars to spot broken tiles. At this point, decide whether the problem needs to be repaired by a professional roofing contractor. If the problem area is difficult to reach, this may be the safer alternative. Plain tiles: To replace a damaged tile, lift up the one above it and prise out the roofing nail. Slide the matching replacement tile into place and secure it with a nail. To avoid damaging the tiles when hammering, place the crowbar over the nail head and hammer that instead. Slate tiles: These often slip out of place and can easily be nailed back into position. If the slate has split, lift off the surrounding slates and remove the part that is still attached, taking care not to damage the roofing material underneath. Slide the replacement slate into place, making sure it is lined up with the adjacent slates, and secure it with tile nails. Replace the surrounding slates. Flat felt roof: This type of roof is prone to blistering and splitting. Cut across the blister with a retractable knife and carefully ease open the edges. Spread bitumen inside the hole. Cut a patch of roofing felt that is 5cm (2in) bigger than the hole and slide it inside, pressing down the edges to seal it against the bitumen. Seal the split with bitumen and allow it to dry. Roofflashing: Re-attach any loose nails and cover them with bitumen to seal the holes. Corrosion holes up to 2cm wide can be patched with matching roof flashing. Cut a piece larger than the hole, roughen up the area and fix the patch with bitumen. Then seal over the patch with bitumen. Badly corroded flashing will need to be replaced. Don’t work on any kind of roof unless you are very confident about your skills and have the right equipment. It is very easy to cause further damage to the roof or to yourself.